Since as long as I can remember rooting for the Bengals, the have been searching for a play maker on defense. A dynamic difference maker who can change the momentum of a gave around in half a second, and can get the crowd going wild with a huge hit or interception return for a touchdown. Basically they have needed an Ed Reed, a Charles Woodson, or a Troy Polamalu. Well there have been many names to wear the stripes that gave us hope they could be just what we are looking for. Players like Jonathan Joseph, Odell Thurman, Keith Rivers and Rey Maualuga. While some of those guys had success in the orange and black, none of them lived up to the billing of the X-factor that the team and fans wanted. Well now, that player is out there in the draft, and the Bengals should pounce on him while they can. He is a player known for being a ball-hawk and a dynamic return man as well as laying big hits on quarterbacks and receivers alike. 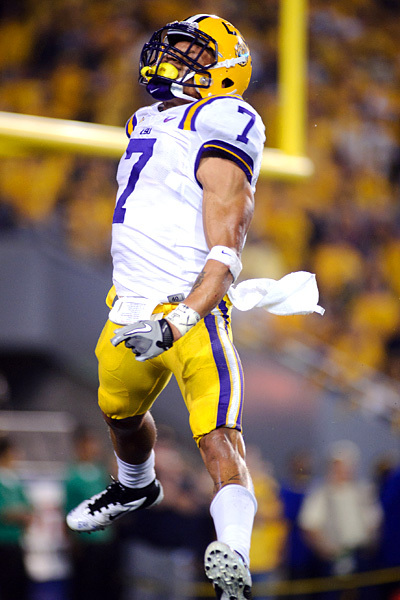 He is the definition of a play maker.His name is, The Honey Badger.You may know him better as Tyrann Mathieu, the LSU corner back who terrorized the SEC for three years and wreaked havoc on the most talented offenses in the nation. Not to mention his ridiculous ability as a punt and kickoff returner and you have the recipe for one hell of a player in the NFL. While he has been looked down upon for being kicked off the LSU squad after failed drug tests, lets not act like he murdered someone. He is a kid who made a mistake, and if Cincinnati can keep Pacman Jones in check then taming the Honey Badger will be a walk in the park for this coaching staff. He is likely to slip in the draft because of his off field issues and the Bengals would be crazy not to jump at the chance to draft Mathieu. The guy is an absolute monster and a terror in the open field once he gets the ball. Take a look at his highlight reel form LSU which is TEN minutes long:You're telling me you wouldn't love to see that guy in orange and black on Sundays? Yeah right. If the Bengals pass on this guy, it will come back to haunt them for years to come. He is fast as anyone on the gridiron and can make a spectacular play out of thin air. He will grow up and the staff will keep him under control like they have done with so many others who have come to Cincinnati with checkered pasts and when he gets on the field he will immediately be a difference maker. He would fit right in with a stacked defense with the likes of Geno Atkins, Leon Hall, Pacman Jones and Carlos Dunlap.Mark my words, this kid will be on a mission to shut up every single one of his critics and I have no doubts that he will. If this beast ends up playing in Paul Brown stadium, may god have mercy on the rest of the AFC north. Make it happen Marvin. Bring the Honey Badger to Cincinnati.